It has become one of the recurring questions of the 2016 presidential campaigns in both parties: Is the U.S. economic system fair to most Americans, or is it “rigged” to favor the rich and powerful? There are notable differences on this issue between – and within – both political parties. Overall, Democrats and Democratic-leaning independents are more likely than Republicans and Republican leaners to view the economic system as unfair (73% vs. 54%). The ideological gap is even starker. Conservative Republicans are split over the fairness of the economic system: 50% say the system favors the powerful, while just about as many (47%) say it’s fair. By contrast, fully 82% of liberal Democrats say the economic system in this country favors powerful interests. A slim 15% think it’s fair to most. The economic differences within parties are striking. 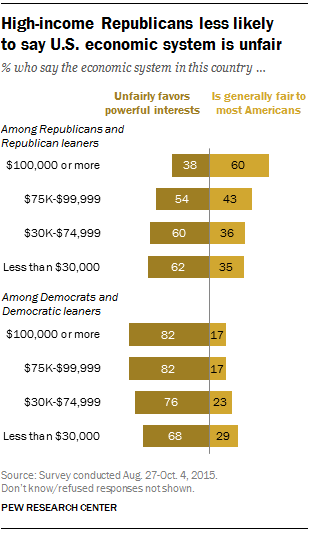 Republicans and Republican leaners with family incomes of $100,000 or more are more likely than any other income group in either party to say the system is fair to most Americans: 60% of Republicans with incomes of at least $100,000 express this view, compared with no more than about four-in-ten Republicans in lower income categories. On the other hand, Democrats and leaners earning less than $30,000 a year are somewhat more likely than those in higher income brackets to say the system is generally fair to most Americans: Nearly three-in-ten (29%) think this.